Resident Evil: Afterlife is a 3D science-fiction action-horror film written and directed by Paul W. S. Anderson, and starring Milla Jovovich, Ali Larter, Kim Coates, Shawn Roberts, Spencer Locke, Boris Kodjoe and Wentworth Miller. It is the fourth installment in a series of film adaptations based loosely on Capcom's survival horror video game series Resident Evil. It is also the first film in the series to be released in 3D. In the film Alice searches for and rescues remaining survivors in Los Angeles of the T-virus outbreak, who team up against Albert Wesker, the head of the Umbrella Corporation. 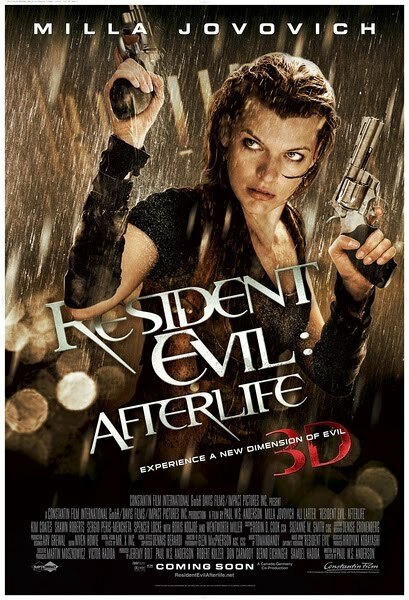 In May 2005, producers mentioned the possibility of following Resident Evil: Extinction with a sequel titled Afterlife. Extinction was released in 2007 and was a box office success prompting Afterlife to begin development in June 2008, with the script being written by Anderson that December. Elements from Resident Evil 5 were incorporated into the film. Chris Redfield, a primary character from the video games was featured for the first time in the film franchise. Other characters from the games and films who return are: Claire Redfield, Albert Wesker and Jill Valentine. Filming took place in Toronto from September to December 2009 using James Cameron's 3D Fusion Camera System. The film was released in 3D and IMAX 3-D theaters on September 10, 2010. After the events of Resident Evil: Extinction, the Alice clones (Jovovich) attempt to kill Albert Wesker (Roberts) at his base in Japan. All the clones are killed in an explosion as Wesker escapes in an aircraft. The original Alice ambushes him, but Wesker injects her with a serum that neutralizes the T-virus in her system, eliminating her superhuman powers and making her human again. Before he can kill her, the aircraft crashes and Alice emerges alone from the wreckage. Many months later, Alice follows a repeating emergency broadcast from a survivors' safe haven known as "Arcadia". After many fruitless months searching for Arcadia and finding no survivors along the way, including her friends from the previous film (among them Claire Redfield (Larter) and K-Mart (Locke)), Alice begins to lose hope, believing herself to be the last surviving human on the planet. Stopping on an abandoned beach, Alice finds the helicopter taken by Claire and the others when they and Alice parted ways in the previous film. A crazed Claire, under the influence of an Umbrella Corporation device attached to her chest, attacks her. Alice removes the device, finding that it has damaged Claire's memory. Claire slowly regains bits and pieces, remembering that Umbrella ambushed their group when they landed on the beach, attaching the devices to them, though she managed to escape. Flying a two-person plane, they enter the ruins of Los Angeles and find a small group of survivors living in a maximum security prison, surrounded by zombies. They land the plane on the roof and learn that Arcadia is actually a cargo tanker traveling along the coast. Since the plane cannot take more than two, Alice and the survivors try to figure out a means to make it to Arcadia together. The survivors have been keeping watch on a prisoner, Chris (Miller), whom they found locked in a maximum security cell when they arrived. He says that he is a soldier who fought the early outbreak, but was locked up by prisoners as a cruel joke when the mission failed and knows a way to reach the coast, and thereby Arcadia, but will not reveal it unless he is released. They do not believe him, and keep him locked up until the zombies manage to tunnel through the sewer ways and up into the prison; Alice and survivors are out of time to find a means to reach Arcadia so they decide to free him and use his escape route. He recognizes Claire and reveals himself as her brother, though she does not remember him. Chris' proposed method—a stored military vehicle—is legitimate, but the vehicle is not operational and they are left with no other option but to use the zombies' tunnel to escape into the sewers, which empties into the coast. The group fights off many zombies—Alice, Claire, and Chris emerging as the only survivors—and escape into the sewers. They continue to Arcadia, finding the ship completely functional, but abandoned. Exploring its inner depths, they realize that it is a trap set by Umbrella to lure survivors to the ship to conduct experiments on them. They release the survivors, among them K-Mart, and Alice continues deeper, finding escape helicopters and a purging bomb. Deeper inward, she finds Wesker, who explains that he has been infected by the T-virus, mutating him and granting him super human abilities, but finds it difficult to control. By assimilating Alice—the only individual to bond successfully with the T-virus—he will be able to gain full mastery of the T-virus. Chris, Claire, and Alice battle Wesker, but he escapes into a helicopter and activates the purging bomb to kill everyone aboard Arcadia. However, he finds that Alice hid the bomb aboard the helicopter and it is destroyed. During the purging bombs explosion, a parachute falling from the sky goes unnoticed by Alice, Claire, and Chris hinting that Wesker may still be alive. Alice resolves to turn Arcadia into a real safe haven and broadcasts its message for any other survivors. As Claire, Chris, and Alice decide how to proceed with all the survivors, they see an approaching Umbrella assault fleet led by Jill Valentine (Guillory), who is under the control of the same Umbrella device used on Claire.